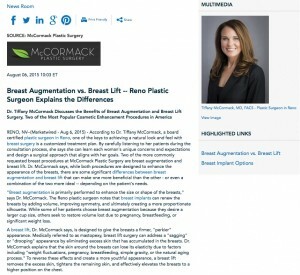 Dr. Tiffany McCormack discusses the benefits of breast augmentation and breast lift surgery, two of the most popular cosmetic enhancement procedures in America. Reno, NV – According to Dr. Tiffany McCormack, a board certified plastic surgeon in Reno, one of the keys to achieving a natural look and feel with breast surgery is a customized treatment plan. By carefully listening to her patients during the consultation process, she says she can learn each woman’s unique concerns and expectations and design a surgical approach that aligns with her goals. Two of the more commonly requested breast procedures at McCormack Plastic Surgery are breast augmentation and breast lift. Dr. McCormack says, while both procedures are designed to enhance the appearance of the breasts, there are some significant differences between breast augmentation and breast lift that can make one more beneficial than the other – or even a combination of the two more ideal – depending on the patient’s needs. “Breast augmentation is primarily performed to enhance the size or shape of the breasts,” says Dr. McCormack. The Reno plastic surgeon notes that breast implants can renew the breasts by adding volume, improving symmetry, and ultimately creating a more proportionate silhouette. While some of her patients choose breast augmentation because they desire a larger cup size, others seek to restore volume lost due to pregnancy, breastfeeding, or significant weight loss. A breast lift, Dr. McCormack says, is designed to give the breasts a firmer, “perkier” appearance. Medically referred to as mastopexy, breast lift surgery can address a “sagging” or “drooping” appearance by eliminating excess skin that has accumulated in the breasts. Dr. McCormack explains that the skin around the breasts can lose its elasticity due to factors including “weight fluctuations, pregnancy, breastfeeding, simple gravity, or the natural aging process.” To reverse these effects and create a more youthful appearance, a breast lift removes the excess skin, tightens the remaining skin, and effectively elevates the breasts to a higher position on the chest. During the consultation process, patients at McCormack Plastic Surgery undergo a physical exam that will help determine their candidacy for each procedure. To help patients decide which procedure is best for them, Dr. McCormack uses Vectra® 3D Imaging technology to generate a “preview” of the potential results of each surgery. Dr. McCormack adds: “Some patients choose to combine breast augmentation with breast lift – also referred to as ‘BAM,’ or Breast Augmentation with Mastopexy – for a more comprehensive rejuvenation.” With that in mind, she notes, the best options for one’s needs is truly dependent on their ultimate goals, and only one procedure or the other may be necessary to achieve them. Dr. Tiffany McCormack is a graduate of the University of Arizona, College of Medicine and completed her training in plastic surgery at Stanford University Medical Center. Her practice, McCormack Plastic Surgery, offers a comprehensive array of procedures for the face, body, and breasts, in addition to non-surgical medical spa services. Certified by the American Board of Plastic Surgery, Dr. McCormack is a Fellow of the American College of Surgeons. She also holds membership in the American Society of Plastic Surgeons and the American Society for Aesthetic Plastic Surgery. Dr. McCormack is available for interview upon request.